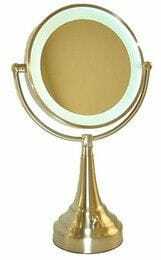 Beauty Mirror or Beauty Mirror with Lights is the first thing many put into Google when searching for a magnifying mirror that is just right for you. Hi it’s Debra with information that will help make your choice easier. The new look My Health and Beauty online store now has a number you can call if you need help with your decision. It’s always very difficult to buy online when you can only make a choice by the picture you see. Questions like I wear glasses and will 5 time magnifications be enough?, Will the mirror fit inside a cabinet?, I just want to put my mirror on the wall just like the hotels do?, Is the light in the LED mirrors white or can I get yellow LED?, Can I put this mirror in the shower? I can’t make the light in my mirror work how do I do that? Now it’s easy -just call the number is on the top of the home page of the shop. Try doing that with an eBay purchase or many of the other companies that masquerade as an Australian company. Across the Christmas New Year period we received many enquiries as those who bought beauty mirrors with lights have found out they have received a US mirror. Generally they tell us it doesn’t work – or can they get a light globe as the other one “blew up”. Unfortunately there are many online companies that sell the American version beauty mirrors with lights that are only 110 volt. Added to that it’s now become very difficult to buy a transformer that will make the mirror work with 110volt. It can be very disappointing to have this happen. I have just 3 tips how you can prevent or at least help out if you have inadvertently purchased the wrong beauty mirror. If you do buy through EBay then make sure you scroll down the left side of the page until you see the Item Location heading under that you must tick Australia Only. EBay have it set on a sneaky default that makes you think it’s all Australian when in fact it’s mostly USA and Asian ebayers. Beware of drop shippers like Fishpond you will get mostly overseas product. If you have received a beauty mirror from overseas and it does not work you should notify PayPal first this will hold the payment up and the supplier has to respond to solve the issue. If you have received a beauty mirror with lights from overseas through eBay and it does not work be sure to email EBay who are very helpful and will do anything to rid their site of these problem sellers. Finally for those searching the My Health and Beauty site for a specific beauty mirror that you might have seen previously. Do not worry MHB does not sell what we do not have. Any models that are out of stock are removed from the live site until they come back into stock. If we have new models coming then they will be announced in advance so you can get the best possible beauty mirror that will be fantastic for you. Remember to keep smiling and have a great week. Hi Everyone Happy New Year we hope you all have a wonderful 2014. Our team here at My Health and Beauty have been working very hard during the holiday break to bring you insights, new product lines and talking with our suppliers to find out what are the latest trends in the US and Europe in magnifying mirrors. During the break we have uploaded our new site hopefully it’s a lot easier to use. There are still a few bugs to sort out with the mobile site and the Twitter, Facebook connections once that’s working well please “Like” us on your Facebook page. This year we will add some competitions to find out how we can best help you. These will get posted on the site and the Facebook page. There will be some great prizes on offer so keep an eye out and be ready. The MHB team bought home some wonderful insights and a couple of new models that will be posted online into the store when they arrive in May this year. The biggest selling mirror in the US ever since magnifying mirrors were produced commercially is the TriFold which is a 3 sided lighted magnifying mirror. It has been updated in terms of looks and most importantly has been specially made for us here in Australia to take 240volt and the correct power plug. What excites us about this model and we believe to be the only model in Australia that can do this is it has 4 different selectable color range options. That means you can choose the best light setting in terms of color that suits your face. Normally all LED magnifying mirror have a very traditional stark white with only some of the better models offered in a softer light. See our LED88C. Our HL Halo models use an incandescent globe which gives the best natural look. Now with the Trifold you will be able to have the best of both worlds. Just select the color lighting that works best for you. The style of Trifold allows for you to not only use the main mirror but allows you to fold out the sides which gives a panoramic view giving you the option to see how you look overall. This new model will come in a 5x and 1x magnification setup which is considered the middle of the road in terms of magnification and generally the most popular. MyHealthandBeauty have been told we can expect this mirror in Australia around May this year. This is around the same time the new LED Lighted Rectangle wall mount mirror will be introduced into Australia. This is a very stylish magnifying mirror as previous models always looked heavy and even clunky. The LED version makes it a style that has proven very popular in the US over the last 12 months since its introduction. The size is 16.5cm wide and 22.5cm high gives excellent coverage of the face I’m sure you will agree. Its LED lighting setup is unique and with long life bulbs and very little energy usage makes this wonderful addition to our wall mount range of magnifying mirrors with lights. Finished in Chrome with a double movement arm that reaches 39cm it can fold back flat on the wall will make this this magnifying mirror very popular for those who like to install the mirror inside a cabinet. Until my next post keep smiling and keep working on your plan for a great year. Merry Christmas Everyone from us all here at My Health and Beauty. The team here have been working very hard looking for mirrors that are different from the average offerings you see online these days. This month we are excited to tell you about our latest new magnifying mirror with light. The model has been named LED88C. LED lighted mirrors are very hard to get right in terms of the type and colour of light. Normal LED lighted magnifying mirrors give a very hard white light or blue colouration which leads you to over compensate when apply makeup. End result being you can get some strange looks when out shopping. The My Health and Beauty team have flown across 20 of these magnifying mirrors ahead of the container so they will now be in stock Dec 1 This will be a first in Australia for a wall mounted lighted magnifying mirror with larger than normal magnification. 8 times magnification sounds a lot however its perfect if you wear glasses every day and you need to take them off to apply cosmetics attend your lashes or hair. LED halo lighted on both sides makes it a very practical mirror in the same way the HL7 and HL8 lighted magnifying mirrors except the LED88C is a slimmer design. This will very much suit those that are looking to mount their magnifying mirror inside a cabinet. This model is made for Australia electrical regulations and comes with a fully approved Australian plug. No need to worry about those dodgy online offers that actually sell American 110 volt mirrors with a funny plug. This LED halo lighted wall mounted magnifying mirror is the latest design and comes in a huge crystal clear 21.5cm (8 ½ inches) diameter with dual-sided, optical quality glass to ensure a clearer reflection of your true self. Duel sided magnifying mirror meaning with 8x magnification on one side and the other standard 1x. It means you can see your whole face without having to move from side to side as normal with small magnifying mirrors and the bonus is it throws no shadows over your face. Use it with or without the light turned on you will still get a beautiful result. Being a wall mounted lighted bathroom mirror it can be tilted, swivelled 360degrees and will extended 34cm (13 1/2 inches) out from the wall, and when you’re finished or fold it back on the wall out of the way or fold back inside your cabinet. 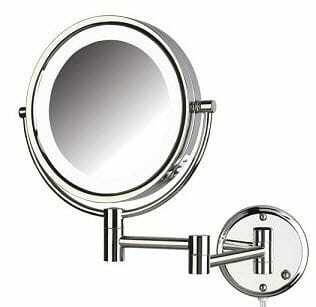 This high quality beautiful lighted magnifying mirror comes with in an easy clean chrome finish and a mounting kit. Best of all the LED energy saving technology globes are super long lasting and use very little power so no more have you got a spare globe worries. We wish you all a Merry Christmas and a Happy 2014. Hi it’s Debra again and the Christmas season will be on us before you know it and our magnifying mirrors will be at the top of many peoples list. Considering some of the things we have seen and heard this year I thought this timely warning might help. Here at the office we have fielded a number of enquiries about magnifying mirrors, magnifying mirrors wall mounted with lights right through to the magnifying makeup mirrors. In the last 12 months there has been an explosion of offerings for magnifying mirrors. Notably there are sites posing as Australian and literally millions of offerings from China. What the consumer does not know is that any lighted magnifying mirror coming from overseas is made to work on the USA 110 volt system. That means the plug is wrong and the wiring is not up to Australian regulations to carry our 240 volt power. This means when plugged in they will burn out either instantly or slowly melt the wiring inside the mirror leaving bare wire which can result in the user getting a shock. More than twice the voltage /power going into undersized wiring is dangerous. Ask before you buy – “Is it 240 volt and does it have an Australian plug”? is the best way to protect yourself. Yes you can buy and use a transformer to solve the problem however the cost of the mirror and the transformer out weigh what you can buy locally. We speak from experience and you would not believe some of the people who rang us asking for advice on what they should they do. They see that we are the Jerdon and Zadro sellers here in Australia and seek recourse from My Health And Beauty. Online sounds great and generally is however Sellers know you are in another country and you just will not get anywhere except a whole lot of noise. At this point I should advise everybody our magnifying mirrors with lights have all been manufactured for Australia 240 volt and as such have the correct wiring, switches and Australian plugs and backed by a manufacturer’s warranty. I do hope this post is of some help to those of you seek a magnifying mirror or at the very least you are a little wiser. Until next time don't forget to smile and be grateful for everything you have. Hello everyone I know we have mentioned this LED magnifying vanity mirror in other articles I thought going a little more in depth may help some make an informed decision. If you don’t like wall mounted mirrors and you’re looking for a vanity model then this is our best lighted makeup mirror NGLED410. Because of its size, it makes a great statement in anyone’s bathroom. 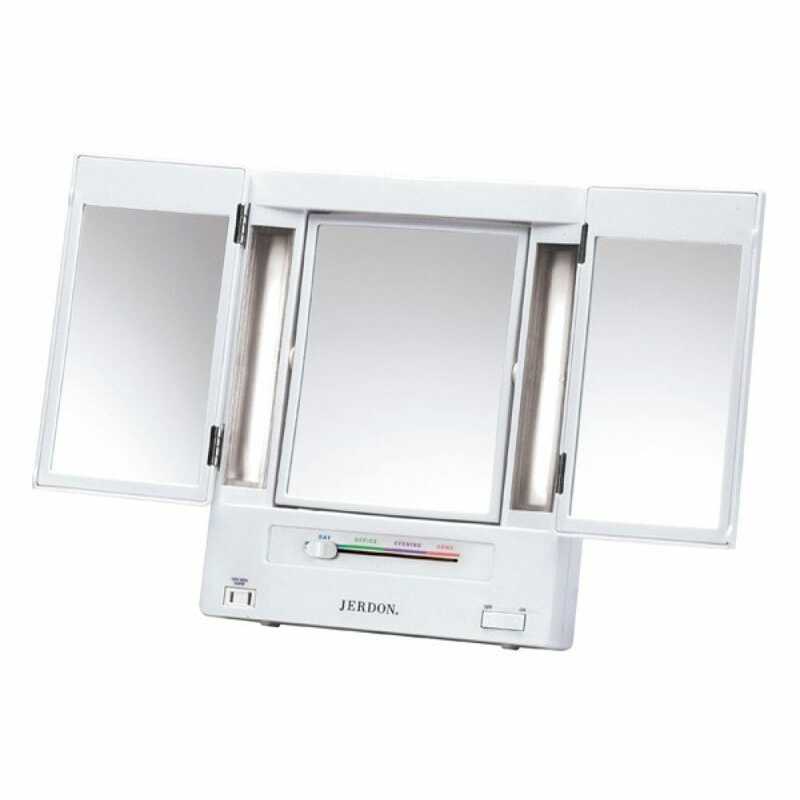 This lighted makeup mirror is special in many ways because of its duel power arrangement. It can run on batteries or be plugged in and run of mains power and best of all it uses LED globes which consume very little power, and never need replacing with manufacturers quoting globes to last a lifetime. Why have a mirror that can run on batteries you may ask? If we think about that for a second then you will realize it’s now cordless and can be used anywhere in the home. To do this there are 4 “C”size cells in the base of the mirror. 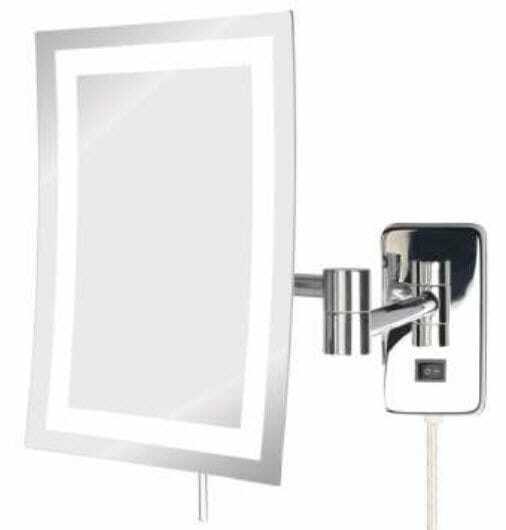 Manufacturers quote that with the LED globes this vanity magnifying mirror will use 70% less energy under normal usage and batteries will last up to 2 years which is not too hard on the pocket. If you want to run the unit off mains power then an external power adapter is provided. The LED halo lighting on the mirror is very crisp bright and clean when using for makeup applications like adding or tinting eye lashes a breeze. The mirror has the halo lighting effect on both sides. Halo lighting refers to the outer rim of the glass that light filters evenly through when switched on giving a lovely clean even glow on the face. The mirror pivots from a 10x magnification on one side and on the reverse side to the normal 1x view. This means you use the 10x for close up work and 1x to check your hair and makeup overall before you leave. For those who recoil in horror the possibility of using a lighted makeup mirror with 10x magnification, be assured it’s the fastest growing magnification in demand. Should you have not seen a 10x magnified lighted makeup mirror before, it does take a little getting used to. Your face on average needs to be around 10cm or 4inches in the old language away from the mirror. Being too close or too far away then the image will appear distorted. From experience we can tell you once someone gets used to using a10x mirror poor eyesight or not they will never go back to anything else. Incidentally we have heard that these mirrors do go missing fortunately most of them turn up in the teenage daughter’s room! And just finally the NGLED410 magnified lighted makeup mirror has an overall height of 46cm with a base 14cm across making the mirror very stable and not that easy to knock over. It really looks the goods in terms of the build quality and the potential value or benefits it can offer your customers. If the customer has not experienced or seen a satin nickel finish before, then the best way to describe it is as a slightly polished stainless steel look with the best part being it does not show finger marks like the chrome or gold mirrors do. The packaging on the NGLED410 lighted makeup mirror is excellent but unfortunately will not fit in a 5kg express bag and so this mirror will always needed to freight by our shipping company Star track Express. It’s best if you can give a commercial address so somebody can sign for the mirror. Star Track will not leave goods if nobody home.